Like so many bugs, they use their sharp mouthparts to pierce plant stems and drink up the sap within. As with aphids, this means that their, erm... poo smells of roses. Well, not roses exactly, but it's sweet and very attractive to various creatures with a sweet tooth. Well, not teeth exactly... Anyway, it's called honeydew, and some treehoppers congregate into herds that may be protected by ants or wasps in return for the sweet, sweet taste of treehopper excrement... mmmm! Without these shepherds lapping the stuff up it would just stay there and start to grow mould, so it's really great to be rid of it. The most distinctive thing about treehoppers is their helmet, a structure that rises up from just behind the head. In some, it's shaped like a thorn and maybe even coloured like a thorn. This provides them with even more camouflage and earns them the name Thorn Bug. Other helmets really do look like helmets, as if they're about to go cycling on tiny bicycles with far too many pedals. Others... others look like nothing on Earth. Seriously, some of these guys look utterly ridiculous, utterly bizarre and utterly absurd. It's utterly amazing! Some look like buds and beetles, some look like twigs, some seem to have an ant coming out of their head, while others are content to have stuff and things, bits and bobs, sheer, indescribable nonsense rising forth from their head like confusion and unanswered questions made palpable. Where does this lunacy come from? Whence the madness? Lots and lots of amazing videos like this at memutic's channel. Check it out! Well, it has recently been discovered that it's an ancestral appendage much like those that have become wings. You see, the thorax of an insect is split into three parts: the first one behind the head usually has just the first pair of legs, the second has more legs and the first pair of wings, the third has the last pairs of wings and legs. 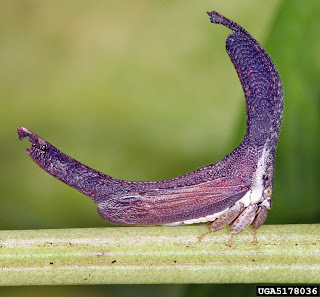 In treehoppers, something rather like even more wings have emerged from the first segment where other insects have just legs. This is the helmet. It's fused onto one piece rather than split in two, but it still has hinges in there as wings do. 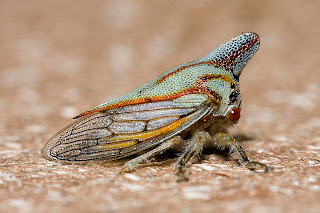 On their final moult, treehoppers even have to expand their helmet in a similar way as all insects have to do to get their wrinkly wing buds into the strong organs of flight they need. You can learn much more about that all over the place, here is a really good one that goes into a nice amount of detail. The best thing about it is that it clearly results in something really weird. Three cheers for that! I don't blame you at all! Grocery stores are one of those amazing things that civilization has brought us and tiny droplets of poo will have extreme difficulty competing with that. The only treehoppers I have seen are either green or brown. I did bot know that they could be so colorful. Yes! It's amazing how diverse and completely strange these creatures can be. I myself only recently found out how peculiar some of them can be. Wow. These things are just... excessive! G;ad to hear it! They are very interesting little insects with this really strange way of walking. I remember seeing large black ones in the garden, they were remarkably loud in flight.